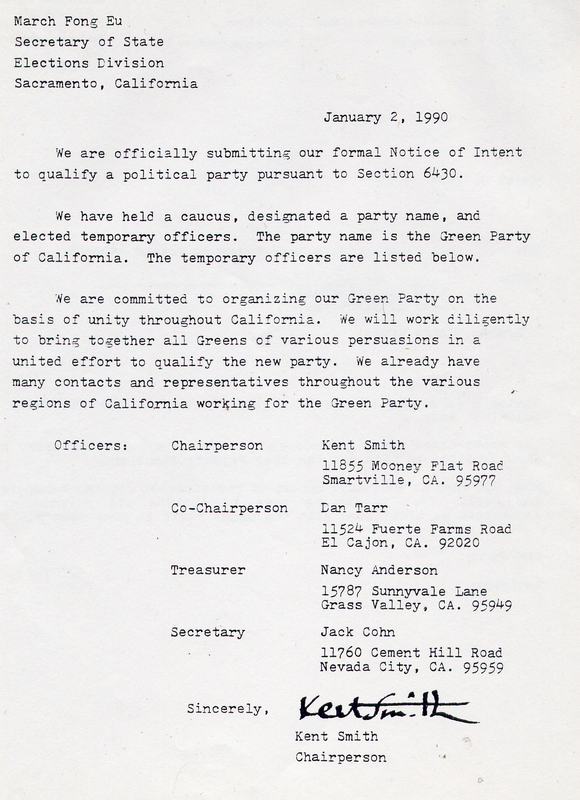 January 2, 1990: Notice of Intent to qualify the Green Party of California, pursuant to Section 6430. 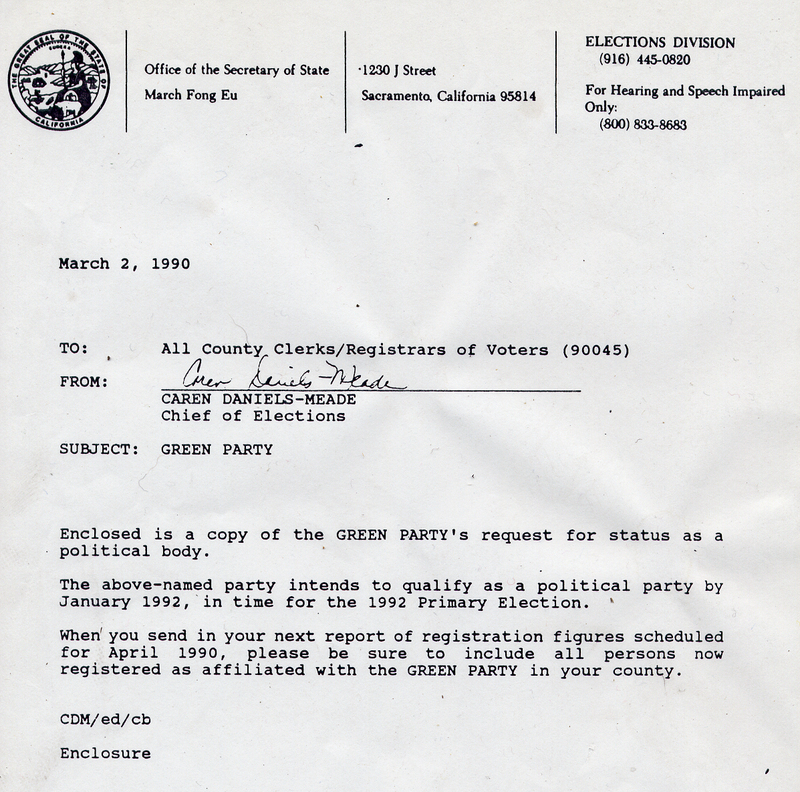 March 2, 1990: The Chief of the Elections Division of the Secretary of State's Office, Caren Daniels-Meade, notifies county registrars of voters that the Green Party of California seeks to qualify as political party by January 1992 and to include all persons registered Green in their next report of registration. 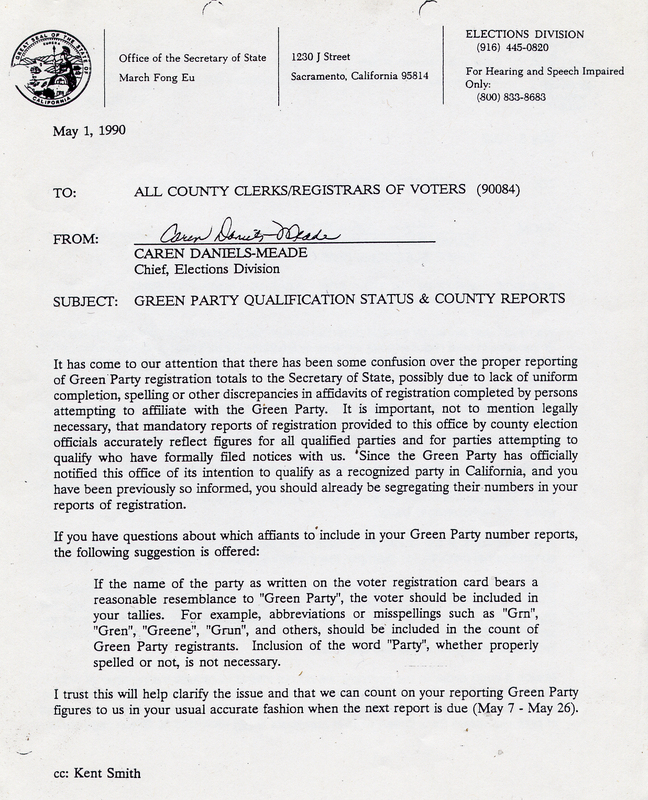 May 1, 1990: The Chief of the Elections Division of the Secretary of State's Office, Caren Daniels-Meade, clarifies to county registrars of voters that if the name of party written on the voter registration card bears a resemblance to Green Party, it should be included in their report of registration. August 28, 1991: The Chief of the Elections Division of the Secretary of State's Office, Caren Daniels-Meade, communicates to the Green Party that it has 33,738 of the 78,992 Green voter registrations necessary for the Green Party to qualify for the ballot for the June 1992 primary election. December 31, 1991: A report from the Secretary of State that shows the December 1991 weekly Green Party registration totals: December 6 (63,646), December 13 (70,273), December 20 (77,548), December 31 (96,354).